Stop, close your eyes, and take a moment to imagine your home without water faucets, without showerheads, without garden hoses, and without toilets. As an American, God has blessed us with clean life-giving water that runs freely from our tap. You use water to drink, to clean, to cook, to grow food, and countless other things. Do you recognize your good fortune in having clean, safe water at the turn of a tap? We often take our water for granted; one of the most abundant and precious resources in the world. However, in South Sudan, not everyone is so lucky. Read about how we have been supporting the people of Sudan since 1998. In my recent visit to South Sudan, I witnessed lives hanging by a thread. 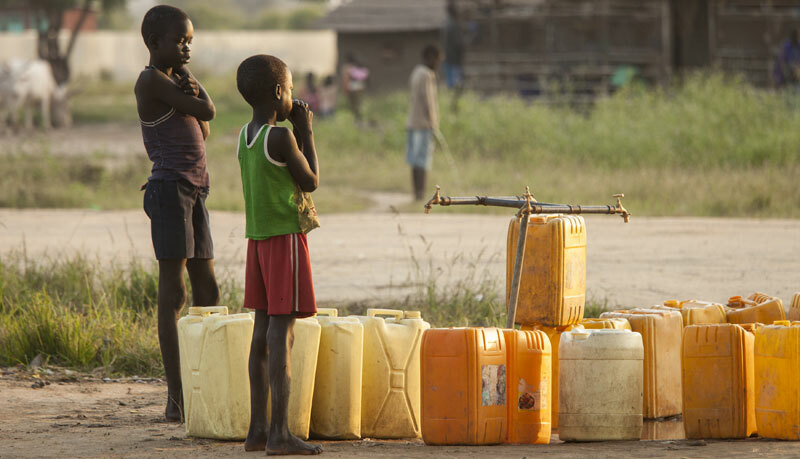 More than thirty percent of the people in South Sudan do not have access to clean water. If only you could see, smell and taste what the people drink. You wouldn’t call it water—it is so dirty, so terrible, and is filled with parasites and bacteria that cause painful, disfiguring diseases. Sometimes it’s more like drinking mud than water, and is sometimes even contaminated with excrement from animals and birds. Watch the heartbreaking story of a South Sudanese man who is the foster father of 16 children who traveled 3 weeks in search of water. I saw thirsty, desperate people risking their lives daily by drinking the filthy water. This can be a death sentence, particularly for children and the elderly. More than 2,500 South Sudanese have been infected with cholera, and more than 1.6 million have severe Malaria. Waterborne diseases are ravaging the country, killing more people in South Sudan than anywhere else in the world. With the upcoming rainy season, civilians are being warned of an exceptionally severe malaria season. reach its fundraising goal of $100,000? 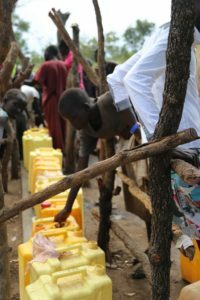 What South Sudan needs now is clean, life-saving water! It is their most critical need and will often mean the difference between life and death. We desperately need a special donation from our donors and friends to bring water to villages where there are no wells. Many boreholes (drilled holes leading to the good water deep underground) have been deliberately destroyed in the Sudan conflict, and the country has an extremely short supply of water. Your special gift to the Sudan Relief Fund today will allow us to drill boreholes to make wells that will give them clean, life-saving water. 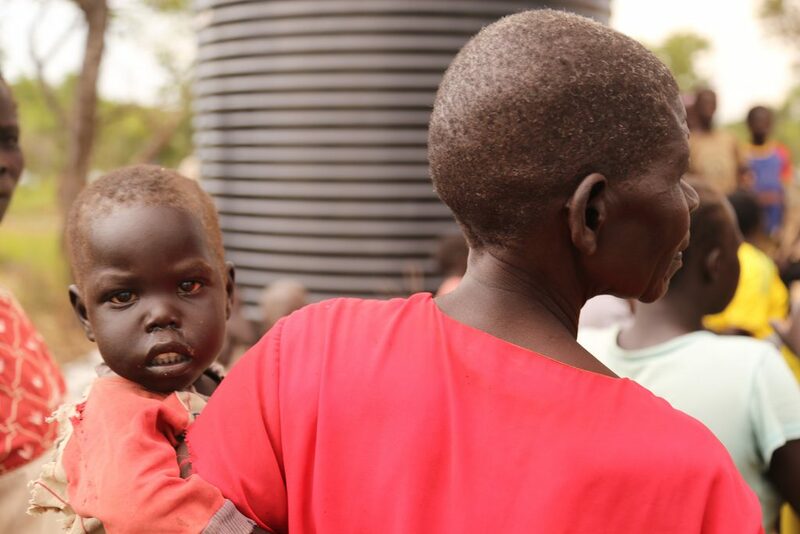 In places like South Sudan, time lost gathering water and suffering from waterborne diseases is limiting people’s true potential, especially women and girls. 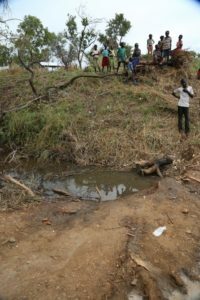 Children 15 years or younger are often responsible for fetching water from distant rivers and mud holes. They risk their health and safety by leaving their protected villages and many have been stripped naked, beaten and even raped. With your help, and your kind donation to the Sudan Relief Fund, South Sudan will get the technical support and equipment needed to dig wells that won’t collapse. We will be able to install pumps, tanks, and solar panels to provide clean water to entire villages. One simple well could save thousands of lives and spare innocent young women and girls harm! It costs $12,000 on average to dig a borehole well. The cost to repair the broken wells is much cheaper – only $3,000 on average. These cover the cost of crews, travel and supplies, including large amounts of cement. The task in this isolated land is not easy and it takes time and hard work. Due to our limited resources, we simply cannot do this without you! We must raise the funds we need for each well before we dig. The wells you help us dig are priceless! Wells are necessary for life, especially during the dry season. Will you give the gift of life that clean, accessible water brings? Every donation counts and will help the Sudan Relief Fund deliver fresh water in the future! With compassionate donors, like you, the Sudan Relief Fund is already making strides toward bringing clean, safe water to my suffering people. Since further fighting erupted, thousands of South Sudanese fled the country to Uganda. Sadly, the refugee settlements weren’t well equipped to host the influx of new refugees. Families and their children went days without water, food, shelter, and hope. However, the good news is that with your kind gifts, the Sudan Relief Fund was able to send $90,000 to a local relief group to help bore a well for refugee camps. An additional $100,000 was also given to a different relief group to help fix water wells and support a rehabilitation program. In total, this will fix 15 boreholes in the coming year, as well as implement a water, sanitation and hygiene (WASH) program in the community. All possible by the generosity of people like you. The Sudan Relief Fund has committed to help provide more sustainable water sources in more villages and towns, but this kind of support is only possible with you! We will be delivering clean fresh water for emergency relief, while also repairing and building new wells for longer sustainability and independence. A dependable supply of water is one of the greatest blessings that you can give. Please give the gift of life-saving water. One of the best ways to help South Sudan survive is by becoming a monthly sustaining partner of the Sudan Relief Fund. By doing so, you commit to an automatic amount to be donated each month. When you commit to monthly support, you provide life-saving water, food, blankets, medicines, and other humanitarian aid. With your generous gift, you will be saving lives! If you already are a monthly donor, we thank you! Hope for a better life in South Sudan springs from a well. Your gift today will provide families and young girls hope to survive against all odds and will give many devastated people faith in their darkest hours. Thank you for your gifts and your prayers. We appreciate your charitable spirit and your love for your brothers and sisters in South Sudan.